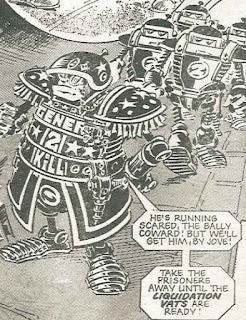 This post is just the latest in a long line of posts I have written about a comic book called 2000 AD. 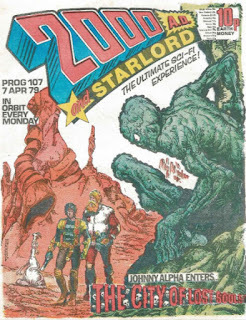 This comic book is still going today, but in these posts I am writing about classic issues from decades in the past, and I suddenly wondered why on earth I’m doing it. Posts about back issues of old comic books are not the most popular on my site, not by a long way. People prefer top 10s, and sci-fi movie news and reviews, yet I continue to read these ancient stories, issue after issue, as if they were still in some way interesting or relevant. I guess it is just because I love them so. The issue I’m talking about in this post, for example, is issue 107 of 2000 AD, and it is a classic, with some quite haunting art and stories. The cover, for example, is a drawing by Carlos Ezquera, and features one of the comic book’s most popular and enduring characters, Johnny Alpha. 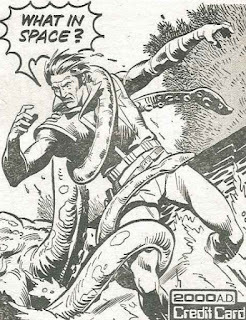 In this week’s issue, Johnny gets sucked into a different dimension, a common sci-fi occurrence, but there is a twist. This different dimension turns out to be Hell itself. We get a hint of this strange new environment in the cover art, which shows a red landscape and some kind of ashy demon thing. 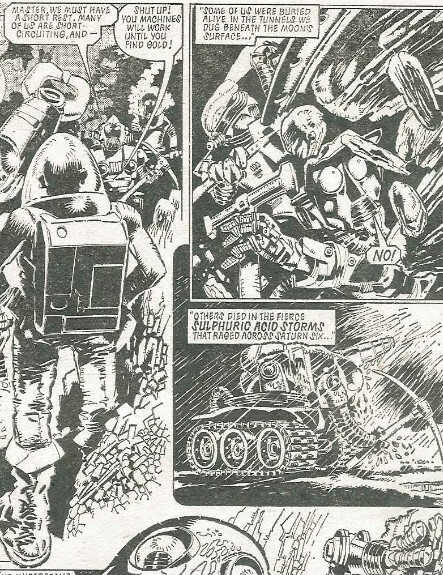 Ezquerra has enthusiastically gone with the audaciously high concept of the story, and yet also gives the Hell that he draws a grounded realism. We’ll have to wait to see exactly what is happening in this cover image though, because the first story of this week’s issue of 2000 AD isn’t Strontium Dog, it is Judge Dredd. 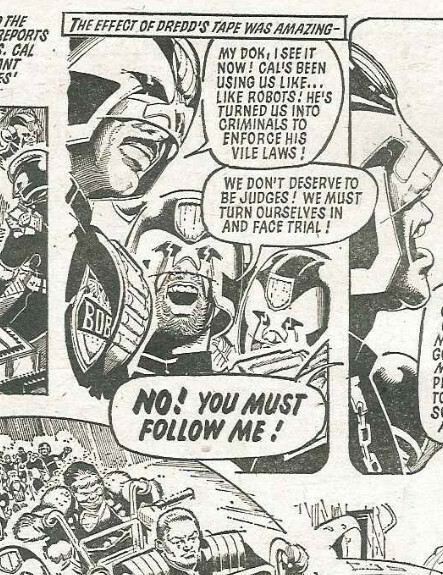 Dredd is struggling to bring the long-running Day the Law Died story arc to something like a satisfying conclusion, but not quite managing it. The art is by R. Smith, which doesn't help. There is something globular and clumsy about his drawing style that makes me think he read How To Draw Comics The Marvel Way and took the advice about drawing a bunch of circles a little too much to heart. 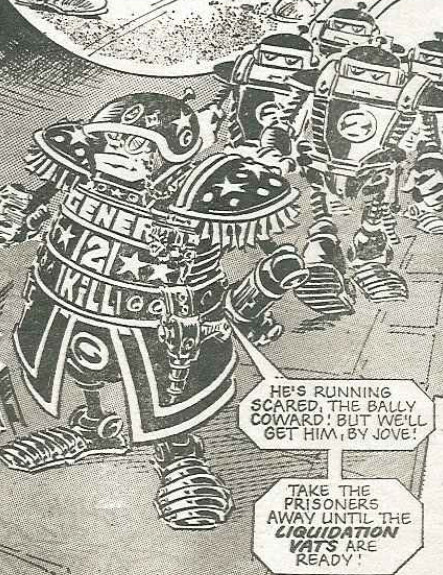 Dredd replaces a crime briefing tape used to hypnotize the other judges into being evil minions with his own tape, and the effects are instant. It’s a little corny, but at least it means the story will be wrapping up soon. Robo-Hunter comes next, with its stupid story and propensity for racial stereotypes. I’ve been looking at the robot general of Army 2, week after week now, and I can’t shake the feeling he is intended to be coded as black. There are elements that don’t fit this interpretation, such as the monocle and the plummy British accent, but the big lips and small nose give me pause. It’s possible the big lips are actually some kind of metal plate, as the soldier behind the general have their mouths mounted in a chest plate, but... again... it just looks bad. Like, racist kind of bad. I would be quicker to dismiss my suspicions if the very same strip, drawn by the very same artists hadn’t had a robot drawn as a vile Jewish stereotype just a few weeks ago. The whole strip is lamebrained and distasteful and I’ve stopped reading it. Now, I just flick through to see if anything catches my attention without really engaging with it. 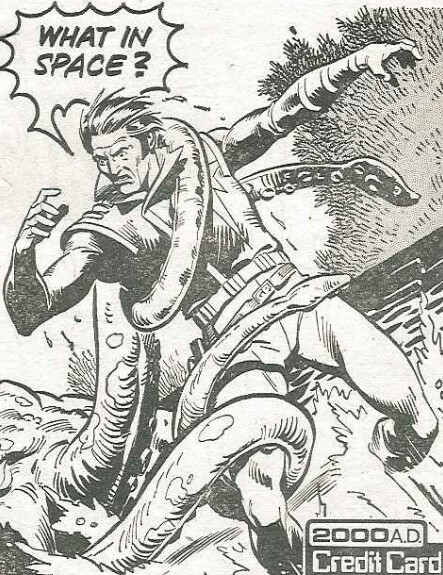 I remember that was pretty much my attitude to Robo-Hunter back when I first read it as a kid, too. After Robo-Hunter comes an ad for a sister comic called Tornado. 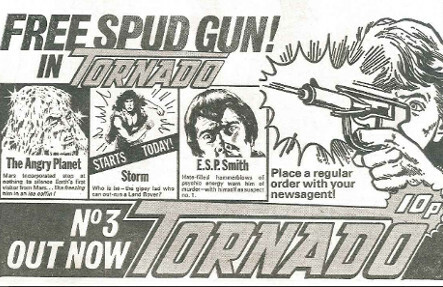 I know I bought the issue of Tornado being advertised, issue 3, because it had a free spud gun on the cover. I was a sucker for a spud gun at that age, and I remember the one I got from Tornado well. The free Tornado spud gun wasn’t my favorite, because my favorite was one designed like a fat laser pistol - which is apparently still one of the most popular designs today - but it didn’t stay air-tight for long and so had to be replaced, which is where the spud gun from Tornado came in. 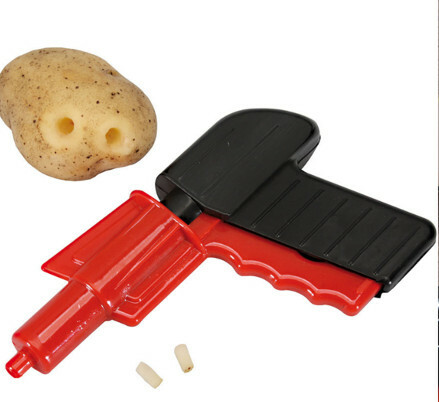 No spud gun lasts forever, meaning new ones must always be purchased to replace the old, malfunctioning ones. Now, at last, we get to see the story that goes with that cover art. I remember being fascinated by the Strontium Dog in hell story. The story explores hell, treating it almost like a documentary depiction of the underworld. Of course, the story is actually just a series of macabre flights of fancy, but they are presented so confidently that you don’t question it. 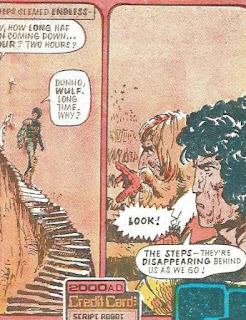 It helps that the art is beautifully drawn by Ezquerra, and eminently enjoyable as something like an extended dream sequence, like Little Nemo in Slumberland or Alice's Adventures in Wonderland. The story starts in the first city of Hell, I guess like Dante’s first circle of hell. Here fire rains down from the sky, which is what turns the inhabitants into hideous creatures covered in green sores. It’s a fate Johnny and his sidekicks are destined to share, if they don’t find a way out of the city. 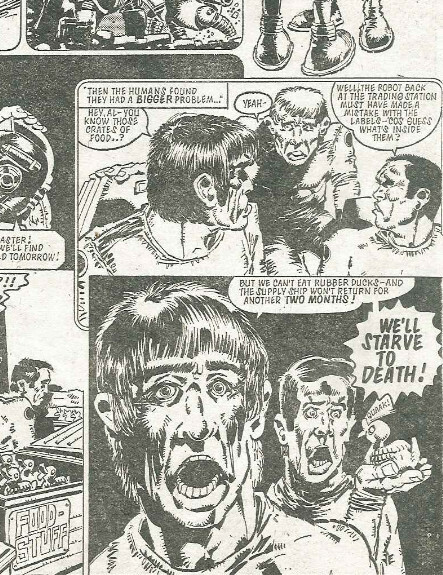 Dan Dare comes next, with the pilot of the future still struggling with memory loss. The art is beautifully and lovingly dawn. You can feel the care that has gone into the crafting of every panel. That doesn’t make the story good, but it does mean the strip is rewarding and enjoyable despite the dull story. The last story for this week is Ro-Busters, and it is amazing. It continues the classic Rise and Fall of Ro-Jaws and Hammerstein story arc that began a few issues ago, and is only now starting to kick into gear. This week, one of the Ro-Busters droids tells the gang of mechanical renegades about a secret off-world colony of robots. The robot’s story takes up pretty much the entirety of this week’s episode and it is the creation myth of this rebel enclave of free robots. The planet was once a mining colony where the human mistreated the robots, working them until they overheated and sending them into dangerous situations to be buried by rock or melted in acid storms. The robots get their revenge, however, by ordering rubber ducks instead of food on one supply drop, and with months to wait for the next drop, all the humans starved. In another strip this might be played as cosmic, future horror: something about the fragility of humanity in the face of an unfeeling universe, but as the robots tell the story to each other from their perspective, it becomes an uplifting story of enslaved robots gaining their freedom. This week’s installment of The Fall and Rise of Ro-Jaws and Hammerstein is drawn by Mike McMahon, which gives it even more of a moving aura. McMahon was always my favorite artist from those days, way back in April 1979. His loose and relaxed style really suits this story. 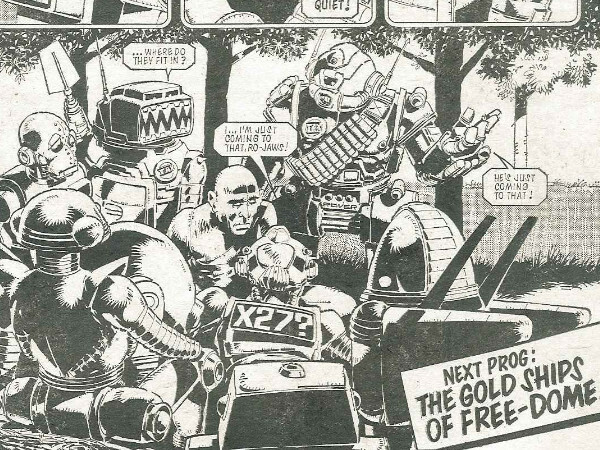 He draws the robots gathered in a woodland glade, pulled in close to hear, as the injured robot tells them a myth of freedom in the stars, and the composition is like an allegorical painting of the last words of a fallen hero... except with robots. It’s a little like a painting of the death of Nelson at Trafalgar. 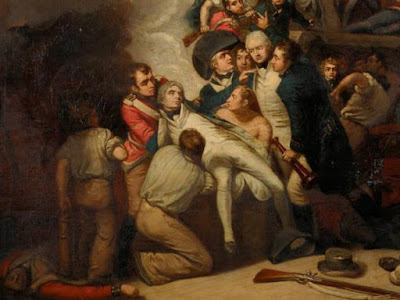 The painting shows Nelson dying in the hands of his comrades. Sadness and chaos predominates the theme of this painting. For an artist to capture something similar with a few pen strokes, using robots as his subject, shows a rare talent. Okay, that’s probably enough about an issue of 2000 AD from almost 40 years ago. 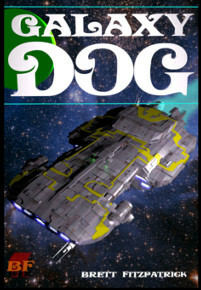 But before we wrap up here, just a reminder that the best way to support this blog is to buy one of my books, so why not go over to Amazon, or Kobo and see if there is one that catches your fancy.